Luci Barker: Switching out my Skincare Routine || Updated Skincare Routine! Switching out my Skincare Routine || Updated Skincare Routine! trusty products and together they’ve really been helping me. So for today’s post I thought I would share with you the products that’s I have been using and my thoughts on them so I hope you enjoy. 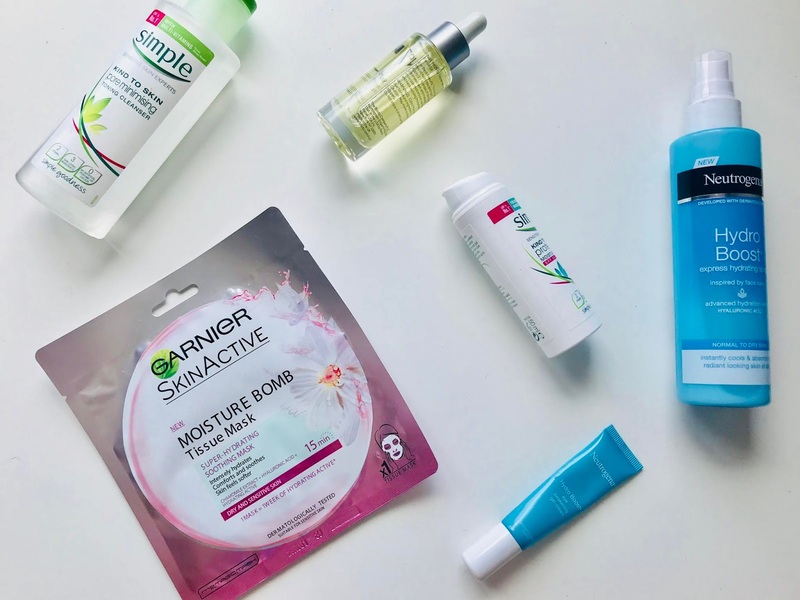 So let’s start with the face masks because let’s be honest, we all love to give our skin a little TLC and chill with a face mask on ... and I’ve been using the Garnier Moisture Bomb Tissue Sheet Mask cos who has time for the hassle of mud masks or peel off ones? These masks aren’t new to my collection as I have been using them for quite a while now, but after taking a break from using them, I thought it was time to give them another go and I’m soo glad I did because nothing works better and for £3.99 (currently on sale for £1.99) you just can’t go wrong, can you really? I find that a lot of sheet masks can slip off your face but with the holes so you can wrap them round your ears, they stay put and tbh I even forgot mine was there after a while oops haha. (At least my skin wasn’t complaining). These masks are so hydrating, cooling ... so if you can acne or just a break out they can really soothe them ... and you can feel the benefits until days after you’ve worn it. I then pick up the Neutrogena Hydra Boost Eye Cream because I’ve been needing an eye cream that’ll help hydrate around my eyes and I know that water based gel products really do the job ... just like the L’Oreal Hydra Genius Liquid Moisturiser. Because this is a gel it really speaks into the skin almost instantly, without creating a barrier of cream and this works well when applying makeup as the concealer can then be blended into the skin and not make it look cakey. This eye cream also has aloe in it, which has helped to soothe and hydrate my dry under eyes and eye lids, and so far, so good. I actually picked up the Neutrogena Hydra Boost Express Hydrating Spray, because I thought it was a facial spray, just like the Mario Badescu Facial Spray, however its more of a facial gel that comes in this spray bottle. As I previously have mentioned, I love water based gel moisturisers as they are so lightweight and are particularly perfect for summer and this is very comparable to the L’Oreal one ... except you do get more product for your money. Simple is one of my all time favourite skincare products as it works really well, the products are all decent sized, they’re easy to get hold of and they’re really well priced. I have been using the simple toner for years now but this pore minimising toner hasn’t been one that I’ve been reaching for as often until recently ... and thank god I have because my skin is thanking me for it. I do have quite big pores on and around my nose that I can get quite conscious about because the only way really to cover them is by using makeup ... particularly primer. Or so I thought, but since using this toner it’s really minimised them and they’re not as obvious as they were and I’m feeling so much better about my skin without makeup. I came across the Protecting Moisture Cream with SPF 30, also from simple, whilst I was browsing on Amazon and I decided to pick it up and give it a go. It was particularly the fact that it has SPF 30 that really stood out to me as most of the moisturiser I use only have SPF 15 or 20 and I like to wear higher ones to protect my skin from ageing (cos we all know my fear of getting wrinkles haha). I will say that this moisturiser is a little thick and does take a while to sink into the skin, but I do apply this 5 or so minutes before my makeup just to give it time to do so. The pros of it being quite thick is that it does hydrate the skin better and really gives that smooth feeling, making it a really good base for makeup. I actually picked up two 50ml bottles of this for less that £7 and that IS a bargain!! Last but not least, I picked up the No7 Youthful Replenishing Facial Oil, which has actually been a product that I’ve been wanting to try for a long while now and I finally caved and picked it up. I use this at the end of my nighttime skincare routine as a bit of a treatment for my skin whilst I sleep. Oils are perfect for treating dry skin, keeping it hydrated and also preventing wrinkles and I have noticed such a difference to my skin since adding oil to my skincare routine (obviously not with the wrinkles!!) but I cannot recommend using facial oil enough to you all and I guarantee that you will notice a difference in your skin very quickly. And there we have it, my updated skincare routine. I really hope you enjoyed this post and you may have even found a few new products that you like the sounds of. Do let me know any products that you may recommend for me in the comments below and I’ll see you soon!! I love Garnier face masks so much, I actually picked one up yesterday for £1.99! Simple are such a great brand and good for sensitive skin! I honestly can't recommend it enough, I'm sure you'll love it too! !